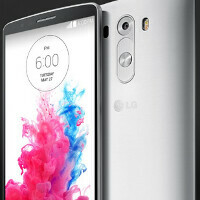 The latest leaked specs we had for the LG G3 indicated that the eagerly awaited new flagship from LG, would be driven by a Snapdragon 805 processor. That information came from someone claiming to be an insider. On Friday, we have information from an insider who allegedly handled the phone. He says that the LG G3 will be powered by a Snapdragon 801 SoC. Other specs from this new source include a 5.5 inch IPS display with 1440 x 2560 resolution. 3GB of RAM will be on board along with 32GB of native storage. There is a microSD slot on this phone, which features a Sony Exmor R camera with OIS+. Android 4.4.2 will be pre-installed, along with LG's Knock Code. The model is expected to be IP67 for dust and water resistance. Some other changes are coming. The Quick Windows case will feature a circle-shaped opening instead of the rectangle used previously, and LG has added new features for the case. We should know all on May 27th when LG is expected to introduce its new top-shelf smartphone. 801 is still very good. Hell 800 is still good. Hell 600 is still good. While I love the 801 performance on my m8, I never once saw lag from the 600 processor on my m7, perhaps you obtained a faulty unit. Hmmmm. 5.5" QHD screen with an 801. Sounds like a valid alternative to a Note 3!!! Nah.. that s-pen is a serious weapon.! An old SOC, deal with it. Other phones will use 805 or 5430 etc., Don't forget it has to drive WQHD resolution, instead of FHD. Believe it or not S4 pro is still alright. Will it affect sales? No. The majority of smartphone consumers probably don't even know that there are 4 cores in their device, let alone the difference between a S800, S801 and S805. is PA that desperate? they want to write a barrage of g3-related articles just for the sake of attracting more readers, up to the extent they just invent one??? Its going to be hard for LG with that adreno 330 to run the QHD display. Nah, not really. We had the nexus 10 driving its display with a considerably weaker gpu, and it did rather well. The 330 was designed for these kinds of displays. You have a point. Its just going to bother the geeks who care for benchmarks, but the problem is, besides the QHD (unnecessary pixels), its not a upgrade over the already awesome LG G2. I was worried how the S801 will handle the QHD display. Then again my Tab Pro 8.4 with QHD Display and S800 proc scored 35.000+ on Antutu. So it'll definitely depends on the Software optimization. Antutu score of 35000 means nothing. When did ever antu score meant anything for GPU performance? Did you ever look like Antutu scores work? If you would have mentioned onscreen fps in GFXbench, that would be another story. I can tell you that your onscreen fps would be like 10. I was referring to overall performance of a device. Tho the original post mentioned only on GPU performance. So yeah.. I'm sorta OOT :D it'd be interesting to see how these S801 proc with QHD Devices will perform compare to the early 2014 flagships. I guess even the S5 prime and HTC One M8 prime will still use the S801.